8th October, Jakarta: Angkana Netrviseth won her second tour title after the Thai triumphed in the Women's division of the ABF Tour Indonesia 2012 while debutant, Williem Widjaya of Indonesia won his first tour title in the Men's division. Netrviseth denied Alisha Nabila of Indonesia a home victory after edging her opponent, 184-171 in the title match to claim the women's crown and Widjaya ended the lucky run of Michael Tsang of Hong Kong with a comfortable 239-198 victory in the men's division. The 23-year-old Thai national bowler, who ended her title drought with a victory at this year's Sinai Open in April, had an early open frame in the second to trail Alisha by 10 pins. But Angkana bounced back with a double strike in the fourth and fifth frames and another double in the seventh and eighth frames to pull away from Alisha. Despite another opened frame in the ninth by the Thai, the Indonesian could not cover her opened frame in the fourth with any double strike. Angkana sailed past a second Indonesian youngster, Aldila Indryati 196-154 in the first semi-finals to book her place in the finals. 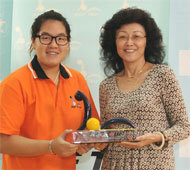 She also edged last year's Tournament of Champions winner, Wendy Chai of Malaysia, 166-154 in the second round. The champion had an easy passage into Round 2 with a victory over a third Indonesian, A. Ayu TD, 231-189 in the opening round. Alisha ousted compatriot, Shinta Noen, 182-167 in the other semi-finals. She also took out two compatriots Ivana Hie, 204-198 in Round 2 and Puteri Astari, 253-204 in Round 1. Meanwhile, tour debutant Williem Widjaya salvaged a victory for Indonesia after the women failed to capitalise with three semi-finalists. Widjaya had a superb start with a double in the title match against Hong Kong's Michael Tsang. The 28-year-old Indonesian held a slender 10 pin lead over his opponent until the eighth frame when he struck home to close out Tsang with 239-198 and take his first-ever tour title. The champion breezed into the finals with a 192-163 win over Thailand's Annop Arromsaranon in the semi. Widjaya was also impressive after beating two compatriots, Jaen Barts, 213-159 in the earlier Round 2 and 2011 Hong Kong leg champion, Yeri Ramadona, 233-201 in the first round. Tsang had a lucky break when he narrowly beat this year's ABF Tour Hong Kong leg champion, Kang Bo Long of Malaysia in a low-scoring semi-finals, 146-140 to advance into the finals. Despite a better match in the final, the Asian Championships Team gold medalist was unable to match the striking power of the champion. Angkana qualified for the Tournament of Champions with her victory to add 75 points to the 18 points she had before this leg. Alisha also made the TOC after adding 60 points to the 33 points she earned in Thailand. ABF Tour Macau leg first runner-up, Julia Lam topped the tour rankings with 105 points to qualify for her second TOC. Hong Kong's Leong Mei Sheung made the cut in 16th position with 46 points. The victory by Williem Widjaya did not secure the Indonesian's qualification with 75 points putting him only in 18th position. Michael Tsang, who finished second also failed to secure a spot in 19th position with 73.5 points. Wu Siu Hong of Hong Kong led the men's ranking with 184 points with Ryan Lalisang of Indonesia moving up into second spot with 177 points. Joshua Chow is 16th in the table with 78 points. The final leg of this year's ABF Tour is the Saudi leg which will be held after the 6th Kingdom of Saudi International Open, on December 22 in Riyadh. Bowlers will have the last chance to earn points to qualify for the TOC schedule for March 11-12, 2013 in Kuwait.